TAK Games > Less than a week until PAX Australia! Less than a week until PAX Australia! Our second favourite weekend of the year! It’s time! The gaming world is about to descend on Melbourne for all things video and tabletop gaming. For the second year in a row, TAK Games will be there conducting Dragon Ball Z TCG demonstrations and Learn to Play events. 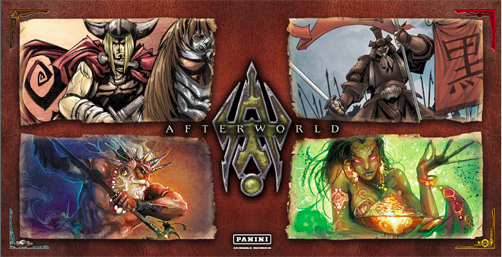 This year we’ll be adding Panini’s brand new game, Afterworld TCG, to the mix! If you are attending PAX, please drop by our booth at TT730 and say hello! Every day at PAX will see three Learn to Play Dragon Ball Z TCG sealed events kick off. For $35 entry, players will receive a starter and 3 booster packs. Everyone will receive a prize for playing, and there will be plenty of cool prizes up for grabs including Dragon Ball Z playmats, deck boxes, sleeves and more! Already know how to play Dragon Ball Z TCG and want to throw down with Australia’s best? Gunslinging will be available all weekend. Come and challenge Worlds invitees Fahad and David to a game! Help them power up for Worlds! Australia’s Ruthless master, Tobye, will also be available for gunslinging challenges. Bring your own deck or use one of ours! Gunslinging prizes are guaranteed regardless of results! Cosplaying as Goku or Master Roshi? Looking to catch all the Dragon Balls (pins) at PAX? Turn up to our booth in a Dragon Ball Z inspired cosplay and receive a free starter deck of Awakening (while stocks last). If you’re interested in checking out Afterworld, demos and learn to play tournaments will be running on demand all weekend! Win playmats, binders, art prints and promos! We’d love your help at PAX. If you would like to provide support in the form of conducting demos for new players, please let us know! Volunteers will be rostered on for up to two 3-hour shifts each day they are available. Volunteers will receive an entry pass to check out the rest of PAX on the days they are rostered on. If you would like to volunteer, please email us at dbz@tak-games.com.au and provide us with the times and days you are available. We can’t wait to enjoy this awesome gaming weekend! – Trent (@TAKGames_Trent) and Kyp (@JustKyp). The year has been a massive for Organised Play in Australia, with Regional Championships seeing some strong numbers across the board. Over $20,000 in prizes on top of the amazing promos and booster prizes have been handed out over the course of the year, and next year we’re hoping to make things bigger and better again. 2016 culminated in the biggest showing of players the game had seen in Australia, including past National events in the old game. 98 players descended on Melbourne to compete over the two days to be crowned National Champion, and earn one of the two World Championship invites up for grabs. With the ebb and flow of recent results across Australia and the US, it was interesting to see the vast differences in decks that turned out. Broly, Cooler, and Piccolo had the strongest showing, after all three have recently shown their dominance across Regional events. But play styles were evenly split across Black, Red, Namekian, and Saiyan Styles making who you drew in your matchups even more important with such a varied field. A full breakdown can be found here. very reminiscent of 2015. Fahad got the burst on Bailey early, dealing some damage to try and push through a tough match up. But towards the end, Bailey got back into the game as only Namekian Piccolo can. He accelerated to Level 4 with the help of Namekian Leaping Kick to try and shut off Fahad using the immediate effects of any Dragon Balls he could steal. The match was tense, with 6 Dragon Balls on Fahad’s side of the field, and the final one sitting with Bailey, protected by Knowledge Mastery, but just a successful Optic Blast away. In the end, Fahad was able to push through enough damage at the end to leave Bailey to draw out on his turn. Top 16, or the Bar? consistent player in Australia, and his top 4 showing at Nationals was no exception. And in this game, he became the gatekeeper to a potential invite for Damien. Coming from a strong background in MTG, Damien showed some great play to push the game all the way. Both players looked to push out some strong damage against their opponent. But this was David’s undoing in the end, as Damien grabbed the win, and an invite to Worlds on the back of milling David for 5 cards after blocking with 13’s Impenetrable Defense while David was on 0 power stages. It was fitting that the day end with an epic best of three encounter that took all three games to decide the winner. In game one, Fahad kept Damien on his toes, with his deck always looking for options to block or get out of combat as fast as it could. Damien used his Beerus ally in game one from the start, and his Nappa ally not seeing much play. This ended up deciding the first match with the Tag Team mastery unable to help him keep Fahad from using his board to grind out the game. But in game two, Damien showed how skillful a player he was, and that he can quickly learn and adapt. Nappa came in quickly and quite possibly never left the field all game. Things looked like they were getting close in the end, but Damien was able to take game two to push a decider. The final game of the tournament was a true testament to Fahad, and his amazing ability to think through a great number of plays to see the correct path to take. Damien pushed his Nappa ally to its limits keeping Fahad under control. But it was a bridge too far, and Fahad came away as National Champion for the second year running. Congratulations again to our Australian qualifiers for the World Championships; Fahad, Damien, and David. We will be there with them in Texas, and we promise to help you follow their progress over the weekend. The second day is about to begin for the 2016 National Championships. Day one was an amazing day with the biggest turn out of players at a National level event (between the old and new game). We’d like to thank everyone who came, and we’re very proud of the way everyone played. With 98 players attending Australia’s largest ever Dragon Ball Z tournament in either Score or Panini Z, the scene is set for an amazing day of play! We’re streaming on Twitch all day, so make sure you tune in and subscribe! Today brings our last preview for Awakening, and this is definitely a favourite for the new set. But before we get to the preview, this weekend is the Australian National Qualifier in Melbourne. Two lucky players will earn invites to this years World Championships in a little under a month. If you want to check out the action, during the US Friday and Saturday evenings, you can check out our stream HERE. With the Black Devious Mastery getting the Frozen List treatment soon, Black will have to conjure up some ways to help maintain some form of hand manipulation. Black Memories offers up a way to bring back those discarding from hand feels Black Style players will start missing. Initially, the power of the card gives it enormous value. With the cost of getting rid of one of your setups or drills, you can forgo something that might not be helping in your current matchup, and pillage your opponents deck for something like a Visiting The Past, to hit them back with what they want to dish out to you. The possibilities are huge. Being a Setup, its sometimes hard to make the space, but offering the parenthetical text just doubles the value of this card further. While it doesn’t give you the same return as a Black Declaration by being placed into play on discard, it does give you a pitch to the new Black Conflict Mastery which emulates the old mastery in a way. It also doesn’t have a stipulation on what causes the discard to occur, so like with Black Command, you can could gain some benefit from any discard of the card when your opponent has 2 or more cards in hand. This is definitely going to be fighting for some space in new Black Conflict Mastery decks.